What’s so super about superheroes? This teen speaker explains. Everyone loves a good superhero story. But why? 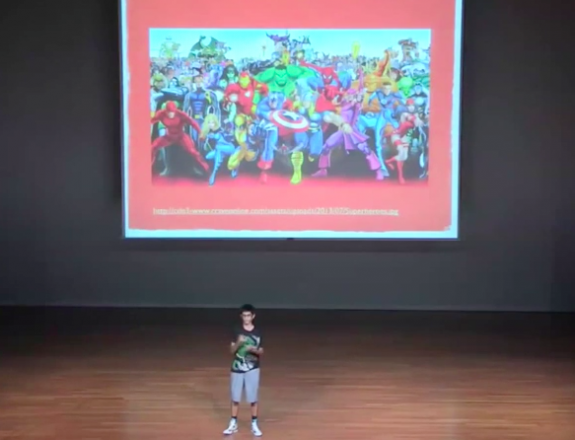 Arjun Mehrotra explores the idea in his TED-Ed Club talk for Singapore’s international school UWC East. To learn more about why the world loves superheroes, watch the talk. Then, read on for an interview with the teen speaker about how superhero stories can inspire people to take action. How do superheroes help people understand the world around us? The most obvious parallel would be “with great power comes great responsibility.” If we are fortunate enough to be in a position of affluence, we should help people less fortunate or privileged than us. Superheroes are great for leadership, because they demonstrate how superheroes are not necessarily accountable to governments, but to the people who believe in them and their ability to set things right. Superheroes frame the world as a place where there are injustices to be corrected and problems to be solved. And superheroes also teach us that we all struggle. We all have our problems. Even superpowers are not a panacea. So superheroes end up teaching people about resilience, courage — and the need to fix things in the world. Not all superheroes are so “super.” Why do you think that flaws and weaknesses are important components of superheroes? I think heroes are flawed for three reasons. First of all, perfect is boring. Just like we don’t read books about characters with perfect lives, we don’t enjoy infallible heroes. Secondly, if a hero is a figure that people should be able to identify with, then a perfect hero alienates people. Why alienate an audience? Thirdly, as the saying goes, “power tends to corrupt and absolute power corrupts absolutely.” If superheroes were infallible, they probably wouldn’t be too super. Vulnerabilities prevent heroes from being invincible and that is important. Batman’s weakness is that he is not a mutant, but a human. He can die with a mere bullet (provided it gets through his armor). He is extremely smart and mentally resilient — yet his mental state can also be a vulnerability. His persistence is a strength — yet it can also cause him to push himself to the brink and not realize that it might be smarter to lose the battle but win the war. Batman’s strengths and weaknesses are quite intertwined, embodying the human spirit in a great manner. Whether you call it vengeance, retribution or justice, he’s driven by emotions that are both “good” and “bad” (depending on how you look at it). Who do you think of as a modern-day superhero? Modern-day heroes need not fly or save the world from mass destruction. To me, modern-day superheroes can be whistleblowers, human rights activists — think Edward Snowden, Julian Assange, Malala Yousafzai. It’s about their deeds, not their abilities. It’s someone who’s doing the things most people don’t have the guts to do. Philip Zimbardo talks about heroism and how it can come into being in the right circumstance — the right situations can provoke heroism (or evil or inaction). Modern-day superheroes are not necessarily heroes in terms of who they are as people — it’s more in terms of what they do when they need to make a difference and actually help someone. It’s the small things sometimes that matter most. A lot of today’s superheroes are rooted in the West, so they subscribe to ideas that people from the West relate to very strongly. But at the same time, comics like Qahera, the 99, and Youmiyat Majida (or Majida’s Diaries, as it’s called in English) are creating heroes and heroines that resonate with the aims and aspirations of people in Egypt, Jordan and other Arab countries, yet differ from the superheroes we normally talk about. For instance, there’s a heroine in one comic who wears a hijab. Many people in the West might think of it as a symbol of oppression, but she wears it because she chooses to. In your talk, you said, “Next time you watch a superhero movie, don’t scoff and dismiss it as something simple. Dig deeper under the surface and look for themes, messages and social impact, just as you would with a piece of literature.” What are your tips for how someone could do this the next time s/he visits a movie theatre? Enjoy the movie, of course, but also consider its similarities to every other hero movie you have seen. Every superhero movie features a struggling protagonist who meets success. This fits in within the wider hero “journey” motif that we see in literature. Also, think critically about the whole conception of the “greater good” outside of the movies. Who defines the greater good? Does this greater good lead to harm against minorities and the marginalized? Question whether the status quo is legitimate or detrimental. Think about the big issues. And then talk to other people about your ideas — after the movie ends, of course! More than 10,000 students are now sharing and presenting their ideas in TED-Ed Clubs around the world. Interested in starting a TED-Ed Club at your school? Find out more. Im impressed by the depth of knowledge & understanding of the realm of Heroes of this teen speaker. I learned a lot from this and will now enjoy & think more when I watch a super hero movie.